Ever since he was 7 years old, Lamar Odom dreamed of playing in the NBA. Basketball was his escape. Nothing could go wrong when he was on the basketball court. It was his place to forget all of the troubles of the world. And there were many. So when he says that June 30, 1999, was one of the happiest days of his life, he's not kidding. That was the day when he was selected as the fourth overall draft pick in the 1999 NBA Draft by the Los Angeles Clippers. All of the hard work he put in his entire life on the basketball court up to that moment had paid off on that day. It was his chance to live out his dream. And he's doing just that. "It's a dream come true," said Odom, who is now a power forward for the Los Angeles Lakers. "I'm living the dream. It's everything that I thought it was going to be. It has been a beautiful experience. It's funny how fast time goes by. It waits for no man. When you're caught up in the moment, [time] doesn't seem to go by. Playing in college and playing in the NBA is something that I will never forget." Life is good for Odom, 29, who lives in Manhattan Beach, Calif., with his longtime girlfriend Liza Morales, their eight-year-old daughter, Destiny, and 5-year-old son, Lamar, junior. With a $13.54 million dollar contract this season and $14.559 million owed to him next season, he can buy just about anything he wants at any time he wants. But it wasn't always that way. Born Nov. 6, 1979, in South Jamaica, NY, an area of New York City ravaged by the crack cocaine epidemic of the 1980s and 90s where, he says, drug deals took place just a few feet away from his childhood home, Odom had to work hard for everything that came his way. He was raised early on by his mother Cathy Mercer who was a corrections and traffic officer who taught him right from wrong before being tragically struck by colon cancer when Odom was 12. His grandmother, Mildred Mercer, took him in and nurtured him, and she supported him on his journey toward the NBA. Odom spent his first three years of high school playing at the Christ The King Regional High School in Middle Village, NY, but due to the frequent bullying from his brother Colton, he transferred to Redemption Christian Academy in Troy, NY, for the basketball season, and then to St. Thomas Aquinas Prep in New Britain, Conn.
As a senior in 1997, he was named as the Parade Magazine Player of the Year and to the USA Today All-USA First Team. The following fall, Odom was supposed to attend the University of Las Vegas, but after a Sports Illustrated article questioned the validity of his standardized test scores, and he reportedly received $5,600 from a booster, UNLV administrators, who were already facing numerous NCAA sanctions for recruiting violations, decided to withdraw his scholarship. After hearing that his former high school coach Jerry DeGregorio, who he used to live with, was hired as an assistant by then head coach Jim Harrick at Rhode Island, Odom chose to go to URI. 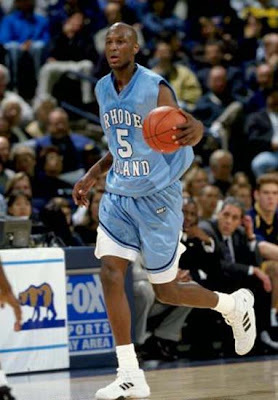 He had to redshirt his first year at the school, but in his first year of eligibility, he led URI to the Atlantic-10 championship in 1999 by averaging 17.6 points per game. "I remember at URI how everything changed when people thought we could win," Odom said. "The attitudes of the students, the faculty, everybody looked forward to going to basketball games. It was fun to be a part of that." The 6-foot-10 versatile forward declared his eligibility after that season and was drafted by the Clippers, who he played with from 1999 through the 2002-03 season. His tenure with the Clippers had a lot of high moments, but it was also marred with injures and off-the-court troubles. He then found a new home with Miami for the 2003-04 season. In the summer of 2004, Odom became a member of the 2004 Olympic team and in the fall, after being traded with Brian Grant and Caron Butler to the Lakers for Shaquille O'Neal, Odom found a new home in Los Angeles. He nearly retired after his six-and-a-half month old son Jayden suffocated in his crib on June 28, 2006, but then thought better of it. After the Lakers lost to the Celtics in the NBA Finals last season, there was some talk of trading Odom, but he told coach Phil Jackson that he would do everything he could to remain in L.A., even if that meant sacrificing playing time. So for the first time in his career, Odom was coming off the bench until center Andrew Bynum's recent injury (knee). "We were in his office and I looked at him straight in the face and told him that I understand the talent that we have on this team, the shot making ability that everyone has, so to be a part of this team, I'll do whatever he needs me to do," Odom said. "I'm playing for a championship caliber team so as a sportsman, that's everything you really want. There are so many average, to good, to great players that don't really get the opportunity to play for a championship caliber team that is capable of winning every game they are in and we all know that's what people want. As a sportsman and as a fan, you want to see a winner." Odom, a terrific all-round player, has averaged 15.2 points, 8.7 rebounds and 4.3 assists throughout his nine-year NBA career. He played a big role in the Lakers run to the NBA Finals last season, and he hopes to win an NBA title this year. "We're confident," Odom said. "It's the same team that we got to the Finals with. Of course with Andrew we are a deeper and a bigger team which makes us better. Nothing is different with him gone. We still have the same mentality - control the paint, move the basketball and get everyone involved." "Our focus was defense going into training camp," Odom added. "We wanted to make it a priority and our record is much better because of it. We feel like we can win every basketball game that we are in."